Brussels/ Halle/Saale. Political decisions are among the main driving forces that influence the survival of biodiversity. They have a direct impact on decisions in key areas of man’s interaction with nature and the countryside, e.g. through agriculture, traffic or infrastructure policies. These decisions also influence many relevant socio-economic processes underlying human activities, writes an international team of scientists in the "Atlas of Biodiversity Risk", the first of its kind to be published. 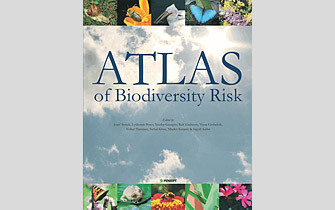 ATLAS of Biodiversity Risk. The Atlas combines the key results of the major European research project ALARM. 366 authors from 43 countries contributed to the 280-page Atlas. The political framework and policy arrangements should focus increasingly on reducing the pressure on biodiversity while integrating recommendations made by scientists and academics. These recommendations should also help politicians to become more aware of the role of policy as a factor in biodiversity loss. To achieve this, more emphasis needs to be placed on the economic, cultural and intangible resources provided by biodiversity. The Atlas combines the key results of the major European research project ALARM (68 partner organisations in 35 countries in Europe and other continents) with some core outputs of numerous other research networks. In total, 366 authors from more than 180 institutions in 43 countries contributed to the 280-page Atlas. 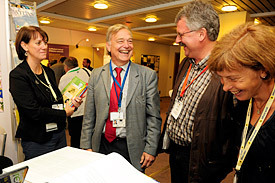 The publication was presented on Thursday at the Green Week conference 2010 in Brussels, to which the European Commission invited around 4,000 participants. 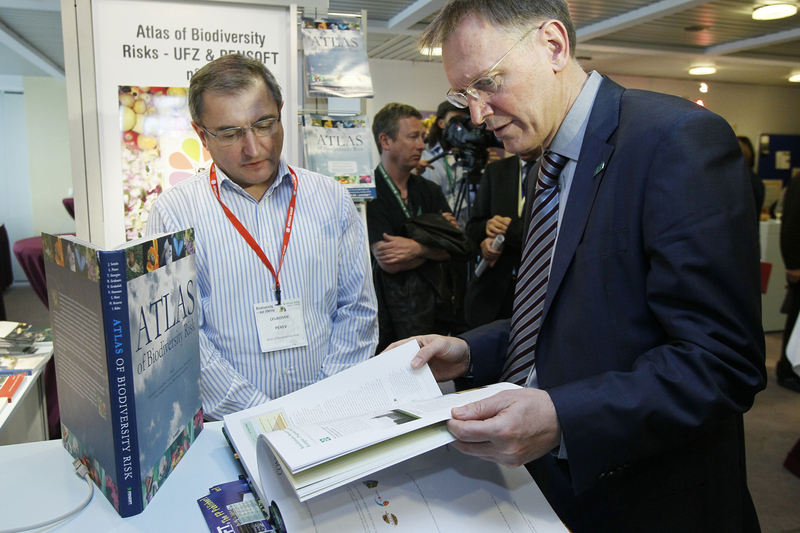 EC Commissioner Janez Potocnik in conversations with Lyubomir Penev short before a copy of the Atlas of Biodiversity Risk was handed over by the editors to Commissioner Potocnik on the 1st of June 2010 during the Green Week in Brussels. Dr. Penev is Co-Editor of the atlas and director of Pensoft Publishing Company Sofia, which produced the Atlas. The cooperation with Pensoft is one of the success stories of cooperations with small and medium sized enterprises (SME) within EC research projects on biodiversity. 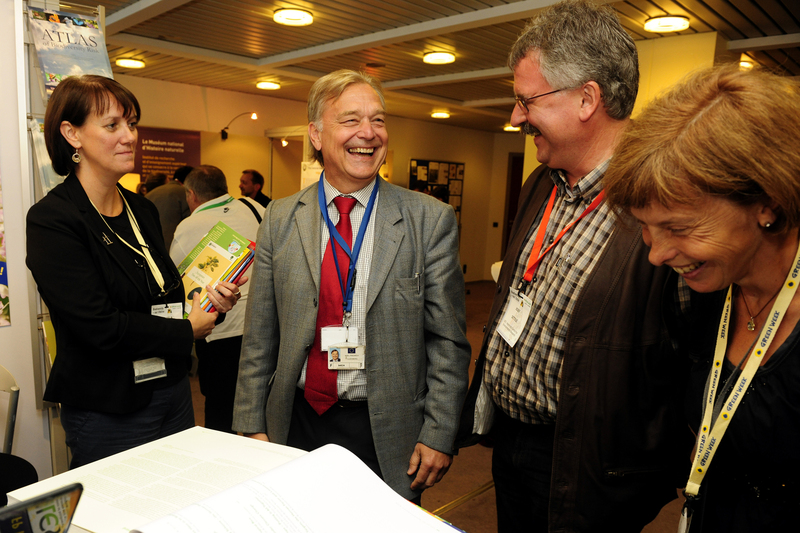 Karl Falkenberg, Director General of the DG Environment of the European Commission, in active dialogue with Josef Settele short before a copy of the Atlas of Biodiversity Risk was handed over to him on the 2nd of June 2010 during the Green Week in Brussels. Dr. Settele is the main editor of the Atlas. Together with a team of 5 colleagues he coordinated the EC project ALARM, from which this atlas originated. He is scientist at the Helmholtz-Centre for Environmental Research - UFZ. The new "Atlas of Biodiversity Risk" is the first of its kind to summarise the major factors leading to the loss of biodiversity on a European and global level. The main risks are caused by global climate and land use change and environmental pollution. The loss of pollinators and the impact of biological invasions are particularly relevant factors which are given special attention. The impact and consequences of biodiversity loss are described with a strong focus on socio-economic factors and their effects on society. "In all these efforts, it must remain clear that no single policy measure will rescue biodiversity - there is no silver bullet. Instead, a systematic review of all policy fields is necessary to incorporate biodiversity," says Dr. Josef Settele of the Helmholtz Centre for Environmental Research (UFZ), who heads the atlas publication team. "Research results should therefore be used to continuously update programs and develop policies for the long term." The `Atlas of Biodiversity Risk´ makes use of three different scenarios for the forecast of effects and the elaboration of potential mitigation options: a) the growth applied strategy (GRAS), b) a Business-As-Might-Be-Usual scenario (BAMBU) and c) a Sustainable European Development Goal (SEDG). "It is important to understand that scenarios are not predictions," says Dr. Joachim H. Spangenberg of SERI (Sustainable Europe Research Institute) Germany, who headed the socio-economic part of the ALARM project. "Scenarios provide a set of reasonable assumptions to help one’s thinking about possible futures and the impact of current decisions on future development. They illustrate what could be the consequences of human decisions." The principles underlying these scenarios are explained and the effects have been modelled and are illustrated and tested in a series of consistent narratives. The Atlas is divided into eleven chapters which deal with the pressures on biodiversity, backed up by more than 100 case studies. The Atlas is written for a wide range of readers. Academics will find summaries of methods, approaches and case studies. Conservationists and policy-makers will use the easy-to-understand recommendations based on academic findings. Lecturers and teachers will find examples to illustrate the major challenges in our century of global environmental changes. "Ultimately everyone concerned about the environment will find the Atlas a strong weapon in their struggle to save biodiversity on our planet," says Lyubomir Penev, one of the co- editors. "We very much hope that the present Atlas will find its way into many organisations, into the public at large, and into decision making processes of the policy sphere," adds Josef Settele, who, together with his eight co-editors from Germany, Slovenia and Bulgaria, firmly believes that biodiversity conservation will not be achieved in an unsustainable society, just as sustainability in society cannot be achieved without safeguarding biodiversity for future generations. The United Nations have declared 2010 as the ‘International Year of Biodiversity’. The goal of this is to bring the issue of biodiversity with its many facets to the collective conscience of the public. With its expertise the UFZ contributes to investigating the consequences and causes of the loss of biodiversity as well as developing mitigation options. At the Helmholtz Centre for Environmental Research (UFZ), scientists research the causes and consequences of far-reaching environmental changes. They study water resources, biological diversity, the consequences of climate change and adaptation possibilities, environmental and biotechnologies, bioenergy, the behaviour of chemicals in the environment and their effect on health, as well as modelling and social science issues. Their guiding research principle is supporting the sustainable use of natural resources and helping to secure these basic requirements of life over the long term in the context of global change. The UFZ employs more than 900 people at its sites in Leipzig, Halle and Magdeburg. It is financed by the German government and by the states of Saxony and Saxony-Anhalt. The Helmholtz Association helps solve major, pressing challenges facing society, science and the economy with top scientific achievements in six research areas: Energy, Earth and Environment, Health, Key Technologies, Structure of Matter, Transport and Space. With nearly 28,000 employees in 16 research centres and an annual budget of around EUR 2.8 billion, the Helmholtz Association is Germany’s largest scientific organisation. Its work follows in the tradition of the natural scientist Hermann von Helmholtz (1821-1894).